Kaju Katli! While I have always purchased sweets for festivals from the market, my mom has been very particular about making them at home. Kaju Katli is one of her (and my) favourite. This is my mom’s recipe for making Kaju Katli, a sweet much loved by all. Ah! the melt in mouth goodness of rich Cashews and Sugar. Despite being a diabetic, I can never resist the charm of KajuKatli. This dish has very few ingredients and steps but still takes a little practice to make it right. The first time I made it, a few years back, I ended up making laddos instead of the lovely diamond shaped barfis. Till date I depend on my mom to spare some for me. 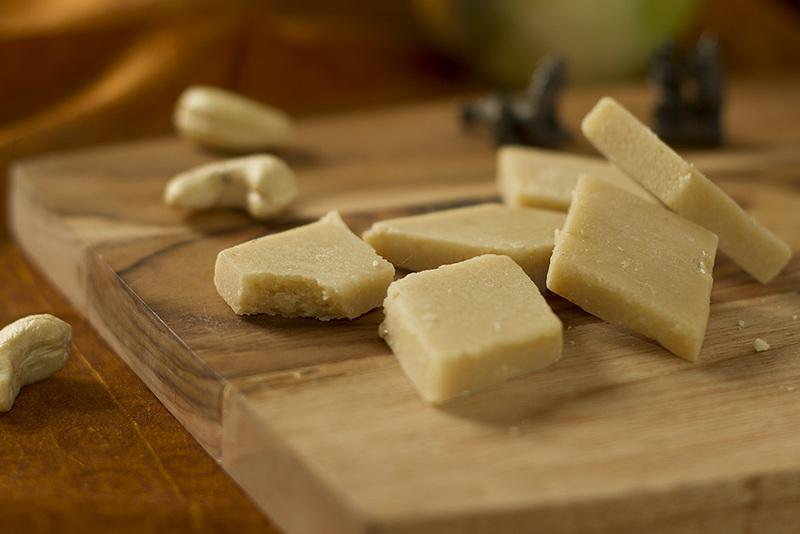 Kaju katli (also known as Kaju Katari or Kaju barfi) is an Indian dessert similar to a barfi. Kaju means cashew nut in Hindi. Barfi is often but not always, made by thickening milk with sugar and other ingredients (dry fruits and mild spices). “Kesar kaju katli” is a kaju barfi recipe that includes saffron. The kesar version of this sweet dish is considered to be more exotic and rich. It is an expensive dessert as compared to its counterparts. Grind the sugar while cashews are soaking. After cashews have been soaked, grind them to a fine paste. Add sugar and mix well. Take a heavy bottomed vessel put it on the stove. Melt the ghee, add the cashew and sugar mixture and cook it on low heat till the paste thickens (about 10 mins or a bit more) and can be rolled. Be careful not to brown or worse burn the paste. Add cardamom powder. Spread a butter paper on the work surface and roll the thickened mixture uniformly. Remember to brush your rolling pin with ghee else the paste will stick to it. Use a sharp knife to cut the rolled mixture into diamond shapes. With practice you get uniform pieces. Let it cool before you separate them. If in a hurry freeze for a couple of minutes.